The ACR33U-A1 SmartDuo SDK is a complete package containing all the vital components required for the development of smart card applications. 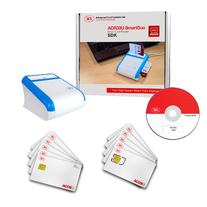 The ACR33U-A1 SmartDuo SDK provides developers with tools and utilities and sample codes, which enable the convenient and effective incorporation of smart cards into their solutions.The ACR33U-A1 SmartDuo SDK is a complete package containing all the vital components required for the development of smart card applications. The ACR33U-A1 SmartDuo SDK provides developers with tools and utilities and sample codes, which enable the convenient and effective incorporation of smart cards into their solutions.